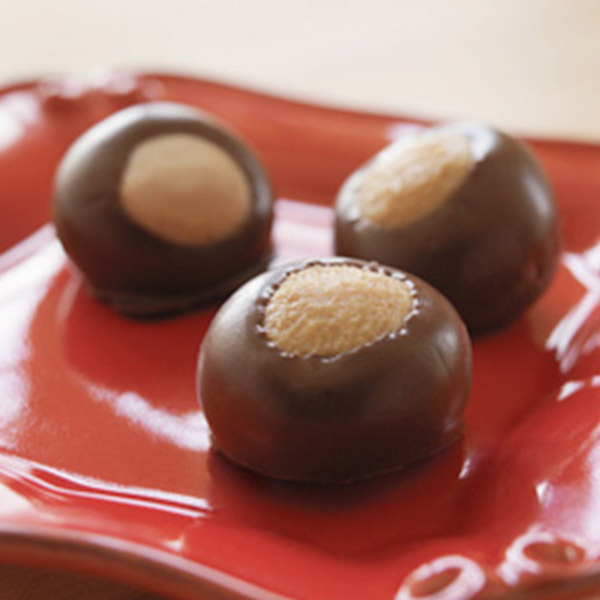 Buckeyes are a treat any time of the year but especially cherished during the holidays. This Christmas candy gets its name from the small, round tree nut that’s dark brown with a tan spot on one side. Our Buckeye recipe calls for peanut butter, chocolate and graham cracker crumbs—a combo sure to be a hit at all of your Christmas gatherings. In a medium bowl, with an electric mixer, blend the peanut butter and butter until soft and creamy. Beat in the confectioners’ sugar. Stir in the graham cracker crumbs. Using a heaping teaspoon of the mixture, roll into balls. Place the balls on a tray and chill in the freezer for 15 minutes. Meanwhile, in a small, deep bowl set over hot, not boiling, water, melt the chocolate chips and shortening, and stir well to blend. Line a cookie sheet with foil and spray lightly with nonstick cooking spray. Spear a buckeye ball with a toothpick and dip into the chocolate to cover three-fourths of the ball. Place on the foil. Chill to set the chocolate coating. Buckeye balls are named for a small, round tree nut that’s dark brown with a tan spot on one side.